Come back on Saturday for another full Store Tour! Another Update on the Marlboro Food Emporium! 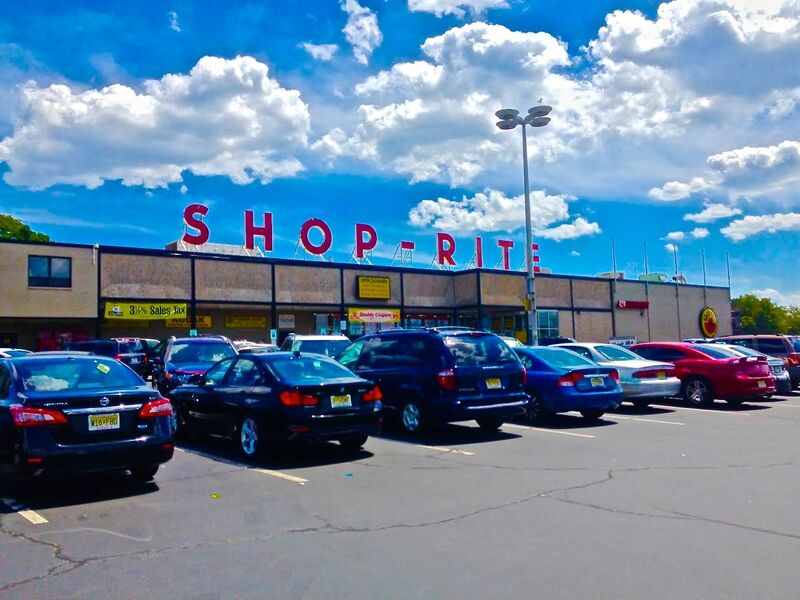 NJ Retail News has been very much on top of covering the latest developments in the renovation and pending opening of The Food Emporium in Marlboro, NJ. Check out their latest article here. Construction has resumed and will be continuing for a few more months. Today's photo is just a cool shot of Superfood Marketplace in Allentown, PA. It's not a former pitched-roof Acme, as I originally thought, but still has an A-frame ceiling. You can check out the entire tour here. We're back to a full store tour tomorrow -- an independent store in White Plains, NY! It's a shot that a family member took at the grand opening of the Elizabeth Food Bazaar. So I can't take credit for it! Over and out for today. Come back on Wednesday for another Snapshot! 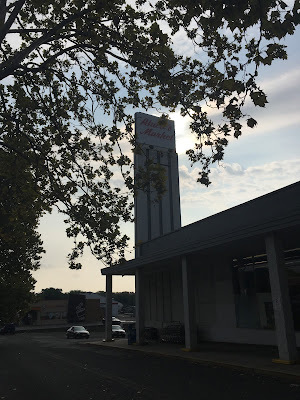 Today we're looking at the only New Jersey location of Ahart's*, in Phillipsburg -- which is right on the Pennsylvania border and is actually considered part of the Lehigh Valley. 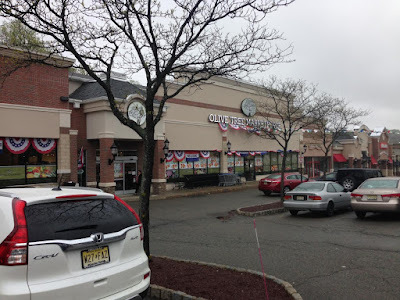 *At first I started to write "...at Ahart's only New Jersey location...", then I stopped myself. Ahart's is already possessive, so it can't be Ahart's'. But the single store is not called Ahart, as the original phrasing would suggest. So I figured it would be best to reword the whole sentence! This store officially closed in June of 2017, even though it has been rumored to close since 2015 when the real-estate company that owns the property and building put it on the market. Rumor has it that the building will be knocked down and replaced with a fast-food restaurant. The Ahart's was, however, still operating (just barely) at the time of my visit in September 2016. It's a former Food Fair that became a Food Lane, owned by the Laneco group which also operated Laneco Super Center department stores. The Food Lane supermarkets were acquired by Supervalu in 1992 and closed by 2001. Ahart's opened in 2001 or 2002 after virtually no renovation. What's funny is that there is no lit sign anywhere on the building. All the signs are painted directly onto the wall, and there is no sign on the front. The entrance is on the front, despite most of the parking being on the two sides and in the back. There is a bread/baked goods section in the front of the store to the right of the entrance, but there is no in-store bakery. Produce continues along the first aisle with meat along the back wall and deli, the store's only service department, in the far back corner. 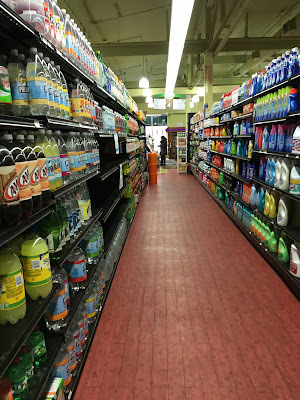 What these photos don't capture is how dirty the store was, and more prominent, how much it smelled. That's a Premium Fresh & Healthy sign from Acme! 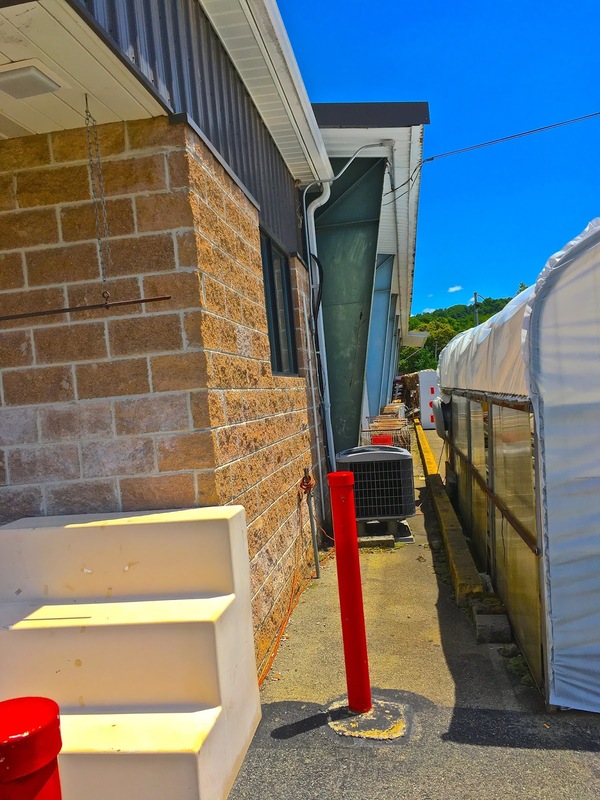 The freezer cases below, which are new, hold frozen meat and seafood. The produce cases are most definitely not new. Back aisle of the store. Deli in the back corner. I don't think I've ever been in a supermarket with those industrial heating units before! Last aisle has dairy cases along the wall. Looking along the front-end. There are a few registers, but Food Fair may originally have had more. One of the "historic" registers, held together with very modern duct tape. I'm glad I got to see Ahart's before it closed. Their other locations are still in business. As far as this one goes, I'm sorry to see a classic supermarket closed and probably knocked down, but I won't be sad to see an Ahart's go. For today's Snapshot, we're taking a look at the last remaining Met Foods in Manhattan. A matter of blocks from the campus of Columbia University, it's been forced to accommodate the changing neighborhood as gentrification spreads from Columbia into Harlem. 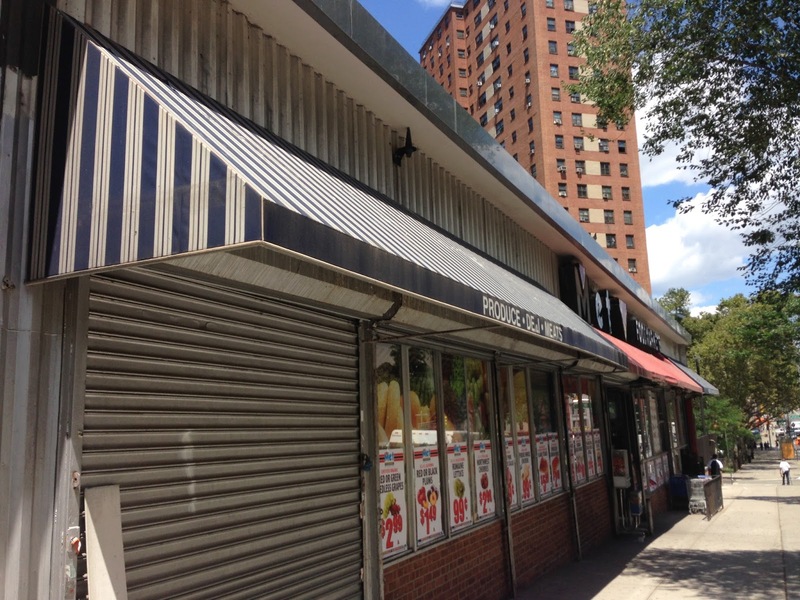 The second-to-last Met Foods in Manhattan was at 251 Mulberry St and is being converted into a brand-new Food Bazaar. The M in Met is missing. Otherwise the storefront looks fine, but a little rundown. 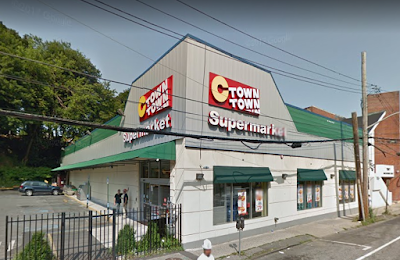 I have the owner of this store listed as Gabriel Estevez, whose family also owns Estevez Foodtown. What a shame that what was probably the last working neon SHOP-RITE sign in use at a store was replaced by this blah facade. It's perfectly nice but come on, you don't see signs like that anymore. ...and the Parade storebrand, although there were several Urban Meadow (Key Food) brand products around. I'm not sure exactly what's going on here. On my most recent visit, the prices (which were pretty high to begin with) had gone up even more. The store was incredibly cold, like there was a problem, not just like they had the AC on high. And, the store was empty (of customers). Someone I know who used to live in an apartment complex within walking distance of this store told me that although the quality is top-notch, the prices are just too high for really any shopping. That's a shame, because our grocery industry here is so competitive. 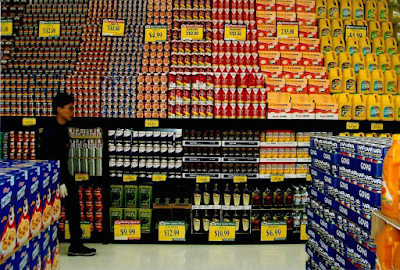 Even slightly higher prices -- or perception of higher prices -- can be destructive to a store. We'll just have to see where that goes. 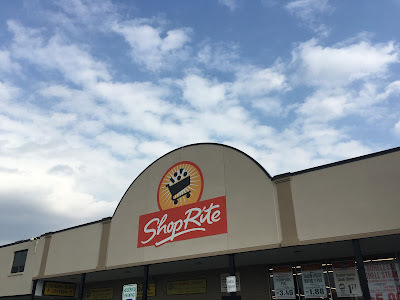 For a while, Acme Markets had a moderate presence in western PA, with locations in Confluence, Connellsville, Uniontown, Salisbury, Meyersdale, Snow Shoe, Johnstown, and Phillipsburg, PA. Today the Confluence location is still very much alive and well, but under the independent Confluence Foodmart, which is affiliated with Western Family Foods (ShurFine/ShurSave). A few blocks to the left in the above photo, you will encounter the Foodmart. Looks like a pretty standard small-town grocery store. 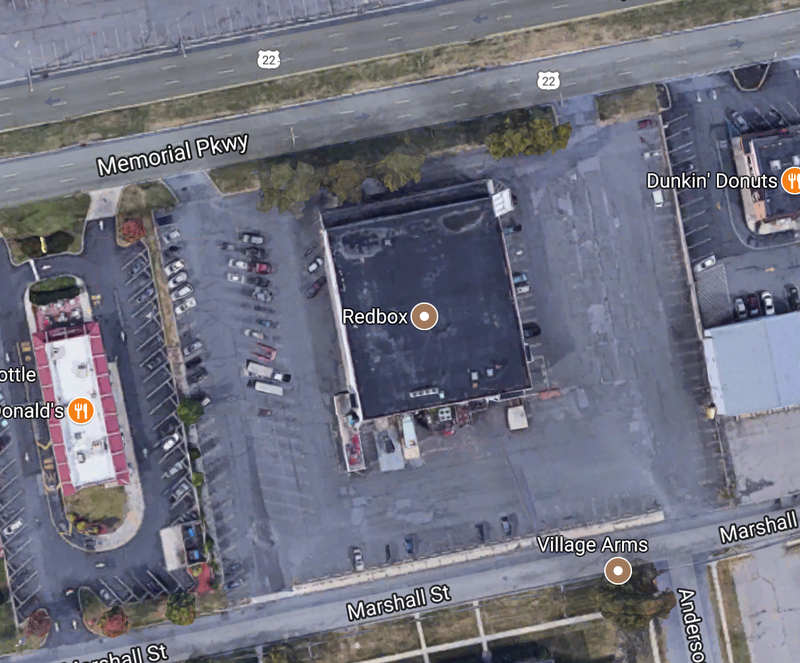 But do you see the pitched-roof Acme hidden behind the cinderblock expansion? Aha! Notice how the beams slant outwards, just as they do in the Canton location, but unlike later-built stores. You enter on the front wall. Produce lines the side wall in the photo above, with meat along the back wall. Deli/bakery is in the far back corner and frozen foods are in the last aisle. There are very few checkouts -- maybe two or three -- and in front of them to the left in the photos above is an expansion (where the Post Office sign is in the photo above) with a large pharmacy and HABA section. Customer service is on the right side wall with pharmacy along the front wall of the expansion. The pharmacy may be operated by an independent business, as it is separately identified as the Yough Valley Pharmacy on the sign. (Yough, here, is pronounced Yawk, and Confluence is on the Youghiogheny ("Yawk-ee-oh-gainy") River. Closeup of the expansion. The main entrance of the store is behind me here. Customer service is along the wall visible here. I stopped into this store for lunch while on the bike trail that passes through town. Although Diamond Produce has a deli, they will not make you a sandwich there. We were directed to the nearby Foodmart, where the deli did (extremely reluctantly) make sandwiches. However, I entered through the pharmacy area, so I didn't realize the store had an open pitched roof until I went farther in. My first thought was ACME! 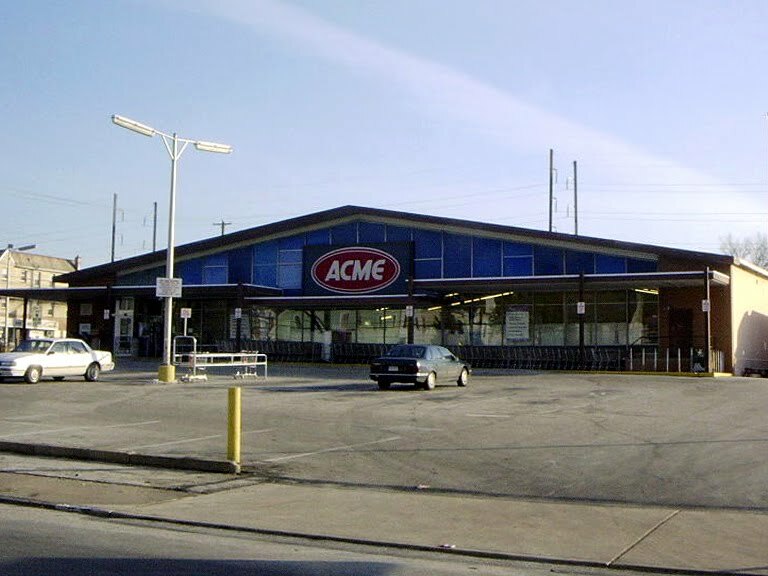 But I ruled out that possibility because I didn't think Acme was ever out this far west, but a quick internet search later that day revealed that they were, in fact, through about the 1970s. Looking from the front of the first aisle towards the back. Most of the cases looked pretty new. The door above is the entrance. Produce lines the side wall about 3/4 of the way down. In the back are frozen seafood cases. The decor, I think, was installed by Confluence Foodmart or at least some prior tenant. Looking from the first aisle across the store. Very impressive, every lightbulb is working! Meat department along the back wall. Two things are a little strange here. First, the sign along the top says only "Foodmart", not "Confluence Foodmart", which makes me wonder if it was brought in from another store. Second, under the butcher window on the left side of the photo here, the cases were stocked with...cakes. Huh? Explain that one to me. Just past the butcher window is a deli/prepared foods self-serve case, then a hot food case, then the deli counter, with a few baked-goods cases past that. A better look along the back wall. 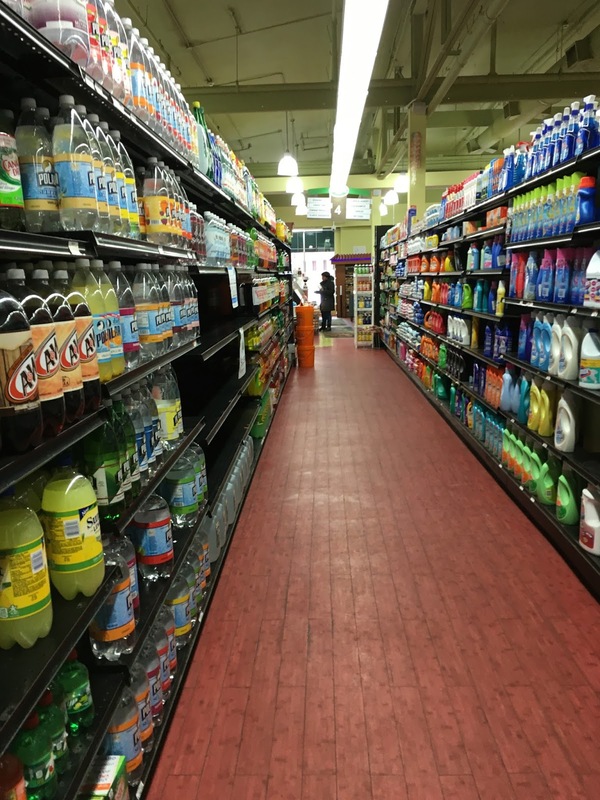 Looking towards the front of the store from a grocery aisle. You can see the walkway into the pharmacy/HABA area from this part of the store. There are a few checkouts to the left of that doorway. The second-to-last aisle has a few freezer cases as well. Deli/hot food are under the DELI sign. I think the Foodmart does bake in-store, but the bakery is not a service department. Can anyone tell what is behind that bakery display? Looks like a freight elevator, but it's a strange place for it, especially since it's right up against that wall. Last aisle looking towards the front of the store. Obviously the freezer cases on the right side are much newer than those on the left side. Boy, that floor sure needs some help also. Looking back up the last aisle. Here we can see the front end. 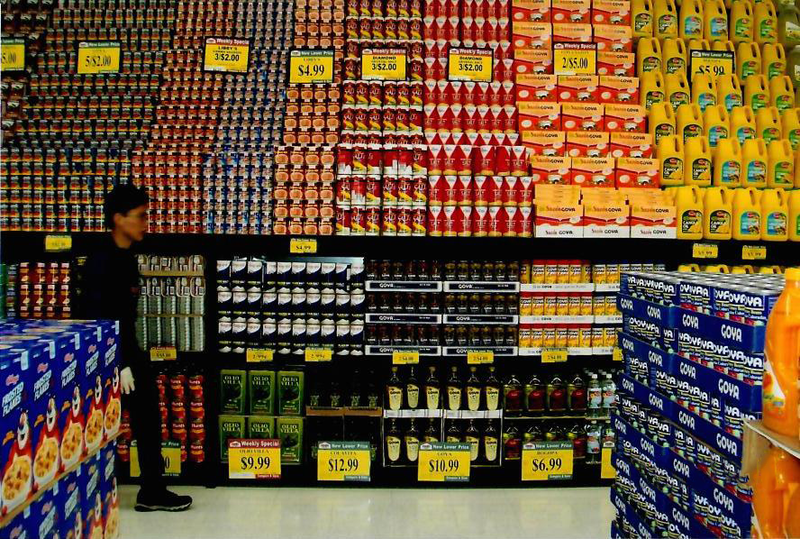 The few registers are past the display of Pepsi cans and the hallway into the expansion is clearly visible to the right here. Looking back towards the supermarket entrance, which is under the sign that says "Food Mart". Customer service is on the right here and the entrance/exit is in front of it. Service pharmacy is behind me. Great selection of HABA and...um...we'll say home goods for a small store. Check out that Weis logo! Pretty cool store for its history. The staff, however, surprisingly was much less friendly than what I'm used to here in the NYC metro area...the exact reverse of what you'd expect!